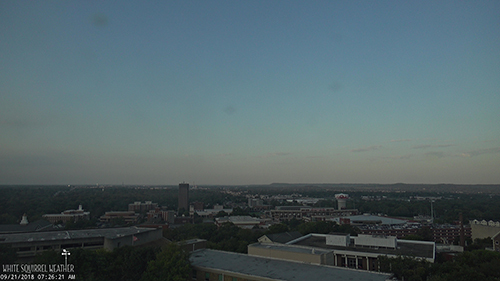 Welcome to Today@WKU, the daily newsletter from WKU Public Affairs, for September 21, 2018. Appointments open for annual WKU vs. MTSU Blood Drive: WKU and Middle Tennessee State University will continue their annual blood drive competition this year to collect donations for the American Red Cross. In Bowling Green, campus and community members can schedule appointments to donate from 10 a.m. to 6 p.m. Oct. 29-31 at the Preston Health and Activities Center. WKU Forensics Team opens season this weekend: The WKU Forensics Team opens its 2018-19 season this weekend by hosting the annual WKU/Alumni Fall Swing Tournament and the Alexis Elliott Memorial Lincoln-Douglas Round Robin debate tournament. Volleyball: Tops Open League Play as MTSU and Charlotte Visit The Hill: Coming off a big midweek victory over Cincinnati, WKU Volleyball has turned its focus to Conference USA play as Middle Tennessee and Charlotte visit The Hill for a pair of weekend matchups. First up, the Blue Raiders stop by E.A. Diddle Arena tonight at 6 before Charlotte heads over with a noon matchup on the docket for Sunday. The Lady Toppers enter weekend action with a 9-5 record while MTSU sits at 4-8 and Charlottes is 9-6. Linebacker Ben Holt continuing his emergence for WKU: Three years ago the career trajectory for Ben Holt may have not quite looked like this. An undersized senior at Bowling Green High School, Holt graduated and enrolled at WKU where he joined the football team – as a walk-on – to play for his dad Nick Holt V (the team’s defensive coordinator at the time) and alongside his brother Nick Holt VI (the team’s starting middle linebacker). When WKU fans looked up Saturday night in Louisville, the youngest Holt had just made a career-high 10 tackles to go along with a sack in what was an announcement to the world that Ben Holt may be about to have a breakout season. 8 a.m.: WKU Forensics Fall Tournament. Garrett Conference Center and other locations. Through Sept. 23. Contact Forensics, (270) 745-6340. 8 a.m.: High School Leadership Conference. Downing Student Union. Contact Student Activities, (270) 745-2459. 6 p.m.: WKU Volleyball vs. Middle Tennessee. Diddle Arena. Contact Athletic Communications, (270) 745-4298. 7:30 p.m.: Concert: The Symphony at WKU. Van Meter Hall. Admission is $10; $5 for students with WKU ID. Contact Music, (270) 745-3751. 9 a.m.: Girls in Engineering, Math and Science Day. Ogden College Hall. Contact Karen Long, (270) 745-3900. 9 a.m.: Museum Day. Kentucky Museum. Contact Kentucky Museum, (270) 745-2592. 10 a.m.: West Kentucky Flat Shod Pleasure Horse Auction. L.D. Brown Agricultural Exposition Center. Contact Ag Expo Center, (270) 745-3976. 8 a.m.: WKU Forensics Fall Tournament. Garrett Conference Center and other locations. Contact Forensics, (270) 745-6340. Noon: WKU Softball vs. John A. Logan College. WKU Softball Field. Contact Athletic Communications, (270) 745-4298. Noon: WKU Volleyball vs. Charlotte. Diddle Arena. Contact Athletic Communications, (270) 745-4298. 3 p.m.: Performance: Sunday Baroque featuring Sarah Berry and Friends. L&N Train Depot, 401 Kentucky St. Contact Music, (270) 745-3751. 10 a.m.: Faculty Workshop: Educating Today’s Student: Inclusive Pedagogy, Equity and Intentionality by Design. Downing Student Union, room 3024. Contact Michael Hanner, (270) 745-2683. 7 p.m. ET: DiscoverWKU Somerset. Center for Rural Development, 2292 U.S. 27, Somerset. Contact Admissions, (270) 745-2551. 7 p.m.: Creative Writing Reading Series: Curtis Crisler, poet. Cherry Hall, room 125. Contact English, (270) 745-3043.